I’VE been writing full-time for six years, but I don’t think I’ve ever actually told anyone I am a writer. But what I do carry is a certain amount of shame about my vocation. I worked on a print floor in my last year of school, and waited tables to put myself through university, but I don’t count these as real ‘day jobs’. 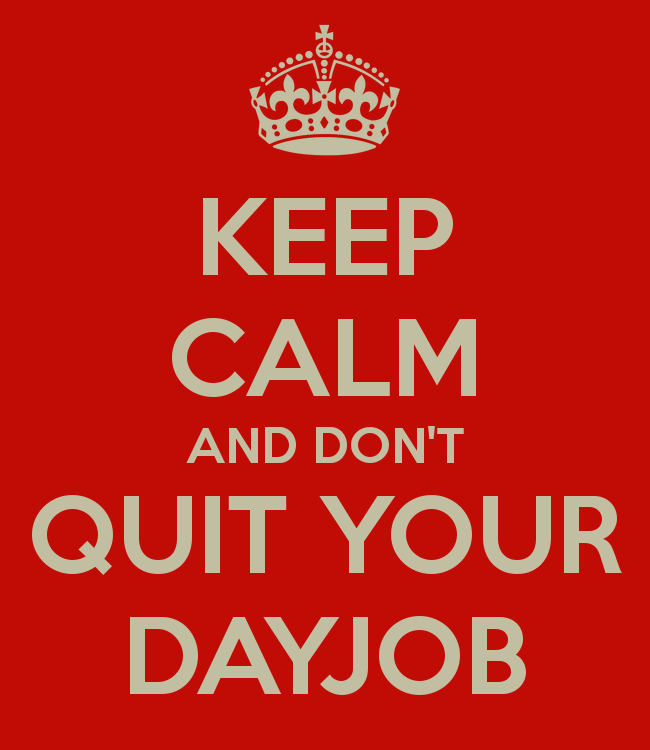 Day jobs are those employment periods you undertake to survive while keeping dreams alive. The Queen of day-jobbers was New York writer Helene Hanff, who floated her writing on the greatest number of day jobs I’ve ever encountered in a creative. I’m proud of my day jobs. They’ve saved me from hunger and homelessness, and given me great inspiration for writing. So, here it is – my ‘other curriculum vitae’ – another way to look at what I’ve done with my life. When I moved to London a friend lined me up with her employment agency, who leapt at the chance to have a man on her books. I only managed to type 36 words a minute (40 was the minimum), so was sent to walk the halls of HarperCollins publishing in west London as a mail trolley boy. Most annoying moment: being so close to real publishers on a daily basis, but having nothing to submit. Career defining moment: deciding I was meant to start writing seriously. If you can’t get a traineeship with the BBC, and you weren’t in the Cambridge Footlights, you can still have a career in London entertainment if you start as a post-production runner. Like ‘sandwich artist’ is designed to net desperate creatives, so ‘post-production runner’ entraps desperate media wannabes… it’s basically catering for the fabulous people. Most annoying moment: not having enough ciabatta to serve lunch to a hungry media maven. Career defining moment: resigning in order to find a job making programs instead of catering for them. 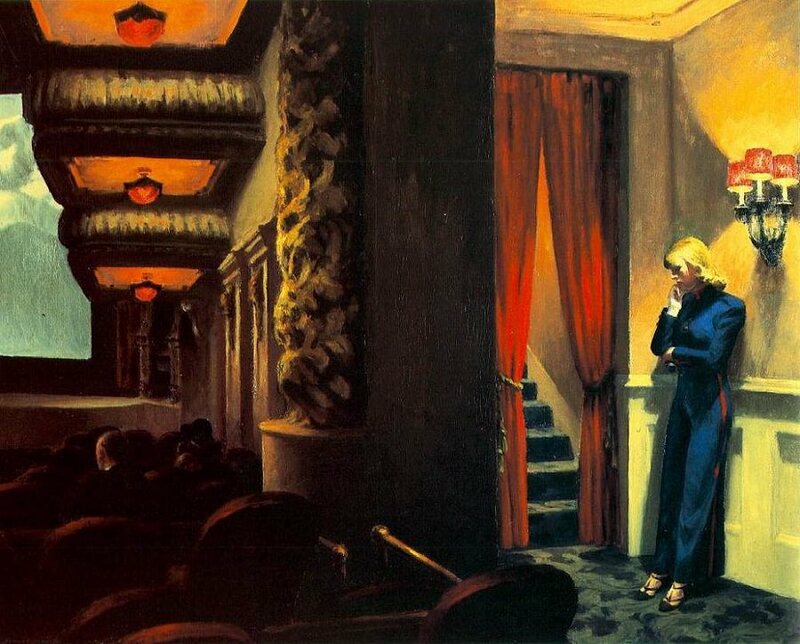 CINEMA LEGEND The misunderstood usher in Edward Hopper’s ‘New York Movie’. Ushering is the staple income of performers – it’s so close to the stage and the screen you can smell it, yet it’s far enough away to keep you driven to find your break wherever you can take it. South of the Thames in the genteel village of Greenwich I took to ticket collecting and didn’t look back. Most annoying moment: realising all-you-can-eat free popcorn is not a great deal after all. Career defining moment: seeing movies so many times I came to understand they’re full of the kind of mistakes media students routinely get shamed for. I came home from England, came out, and landed in career no-man’s-land. When the applications went nowhere, I went to the local Coles supermarket to work in the delicatessen. Refreshing the grey surface of trays of liver has never been as exciting. Warning for shoppers: deli staff give you nick-names based on your lip-licking, hungry-eyed facial expressions. Most annoying moment: having to hide in the cool room to avoid my high school classmates and teachers. Career defining moment: my Food Handling and Hygiene Certificate. It got me out of liver and shaved ham, but the travel industry was undiscovered country of its own. Daily struggles with brochure sorting, accounting systems, and fakey-fake customer service saw me come undone about the time I was let go because they only needed someone to cover the pre-Christmas rush. Most annoying moment: having to remind the boss that giving discount deals only to straight people was actually illegal. Career defining moment: seeing the new girl with the Ivana Trump hairdo go to lunch and never come back. Suddenly widowed at 34, career dreams down the toilet, I joined the ranks of return-to-work mums and the recently redundant, caring for older people living in their own homes. Most annoying moment: when I realised the system was so stacked against many older people there’s almost nothing you can do to really help them. Career defining moment: it’ll come to me one day. Taking punters’ tickets at the door, playing with sound and light in enormous accoustically-perfect caverns, telling stories with drama and comedy, and often getting a round of applause… well, cave guiding was a distracting day job and fitness program in one. Most annoying moment: the petty jealousies and power trips of the public service… can’t pick one. Career defining moment: fooling entire Ghost Tour groups into believing we were completely lost. THE CAVE GIRLS An image which may include Katie Webb, her sister and mother. A Writer’s day job leads to an encounter with a legend. IN late 2008 when I trained as a guide at Jenolan Caves, probably Australia’s best-known cave system, I embarked on a fascinating journey. Jenolan is a world of its own, with its own folklore, and within the network of caverns resides a collection of intriguing stories. For a theatre worker, the task of taking tickets at the door, leading guests on adventures in the dark, retelling stories, playing with light and sound to enhance the experience, in underground chambers of acoustic perfection, often followed by a round of applause, felt like a return to the magic backstage world of a real theatre. Jenolan guides, when I trained, were given little written material on the history of the place. We needed to glean the legends of the caves from our more experienced peers. I realised very quickly that the men and women who hold Jenolan’s stories were taught the same cycles by their peers, and that I was being given access to a unique oral history with a very immediate link to the past. The story which intrigued me the most was that of Katie Webb, and her cave exploring sisters, long ago dubbed ‘The Cave Girls’. This article was published in Blue Mountains Life (Vintage Press) in October-November 2010. CAVE ART Possibly the earliest surviving image of the Grand Arch of Jenolan Caves, known in 1861 as Fish River Caves. 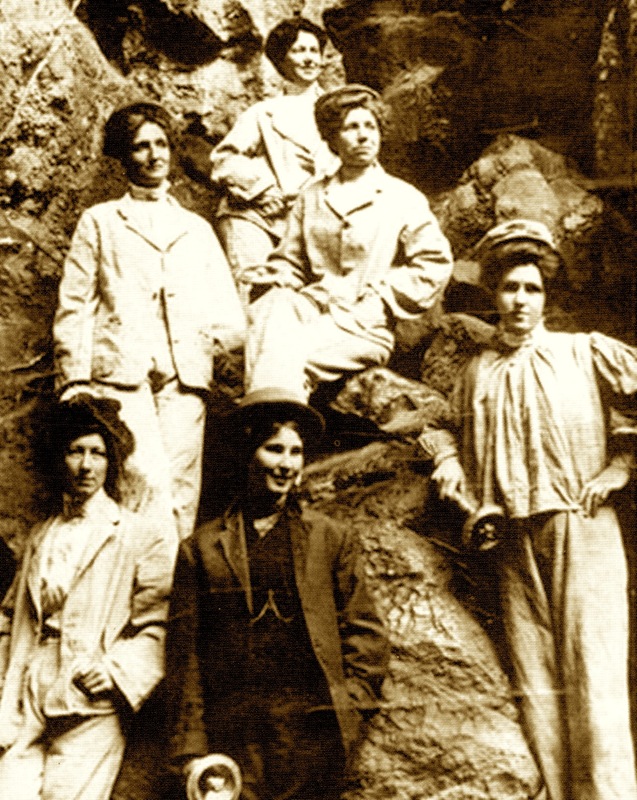 The Legend of Katie Webb & Jenolan’s female explorers. Of his visit to Katie’s Bower in Jenolan’s Left Imperial Cave during the 1880s, Samuel Cook wrote: “Descending 14 steps into the Bower there is a fountain full of lime-water, and a plate suitably inscribed conveys the information that Katie’s Bower was discovered on the 7th February, 1881, by Jeremiah Wilson (guide), C. Webb, H. Fulton, C. West, J. Bright, E. Webb, E. T. Webb, J. Thompson, W. H. Webb, E. Bowman, W. Thompson, J. M’Phillamy, R. Thompson, J. Webb, and S. Webb. The before-mentioned gentlemen were the first to enter the Bower after its discovery”. Despite the placement given to Jeremiah Wilson, persistent legends credit the second name on the list – ‘C.Webb’ – with the discovery of the chamber. This person was not a ‘before-mentioned gentleman’, but Catherine, or ‘Katie’ Webb. For the 170 years that Jenolan has attracted tourists, there has been a hunger for guides to interpret their mysteries, and cave discovery tales rank amongst the most retold. Years of tradition have made Jenolan’s guiding staff into the keepers of the Caves’ stories. Rebecca Lewis has been a Jenolan guide since 2006, and has collected information about the first woman credited with the discovery of a Jenolan cave. “This story is all oral history, and it varies depending on who you talk to,” Beck says. Katie Webb was not the first female explorer at Jenolan. Thirty years before, legend tells of the caving exploits of Jane Falls. “Everything we know about her is basically guesswork from piecing together the signatures she left behind in the caves,” Rebecca explains. “It was common practice for the visitors of her time to sign their names on the cave walls to prove they had been there, like leaving our names in a visitors’ book today”. “The most talked-about signature of Jane is at a place called ‘Signature Rock’ in the Elder Cave (also referred to as ‘The Plughole’). “The signature reads ‘J Falls 27th December 1854’,” Beck outlines. One appearance of a ‘J. 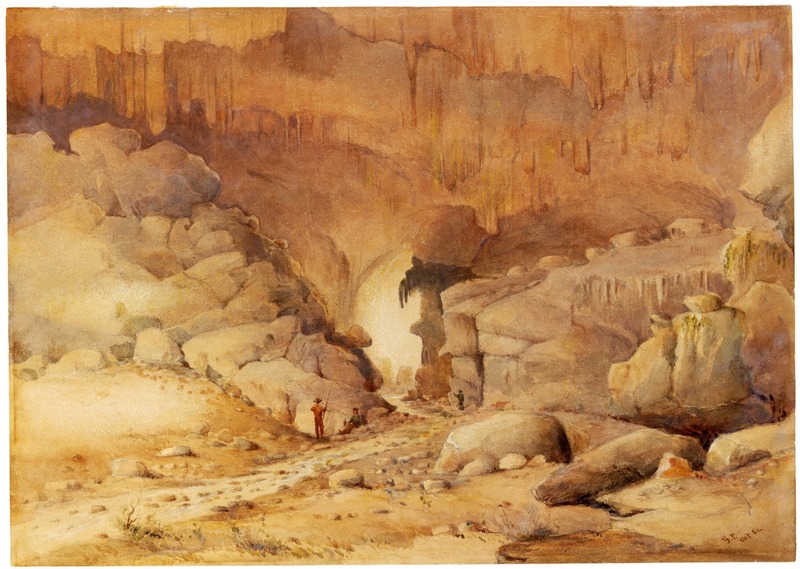 Falls’ signature has challenged the discovery of Jenolan’s popular Lucas Cave. “A signature of hers remains in the original entrance of the Lucas Cave, known as the ‘Sole of the Boot’. It’s been sighted many times over the years, however, every time we mount an expedition to photograph it we cannot relocate it to do so!” Rebecca says. According to some guides, the signature is dated 1858, predating the established discovery of the Lucas Cave by Nicholas Irwin and George Whiting by two years. While researching for newspaper reports of the Lucas Cave’s discovery (which might clear up the mystery), Jenolan guide and historical researcher, David Hay, found that the originals in Sydney’s Mitchell Library have disappeared. “It’s almost as though someone pinched them,” he laughs. Tantalising myths and very little evidence leaves us to explore the possibilities. 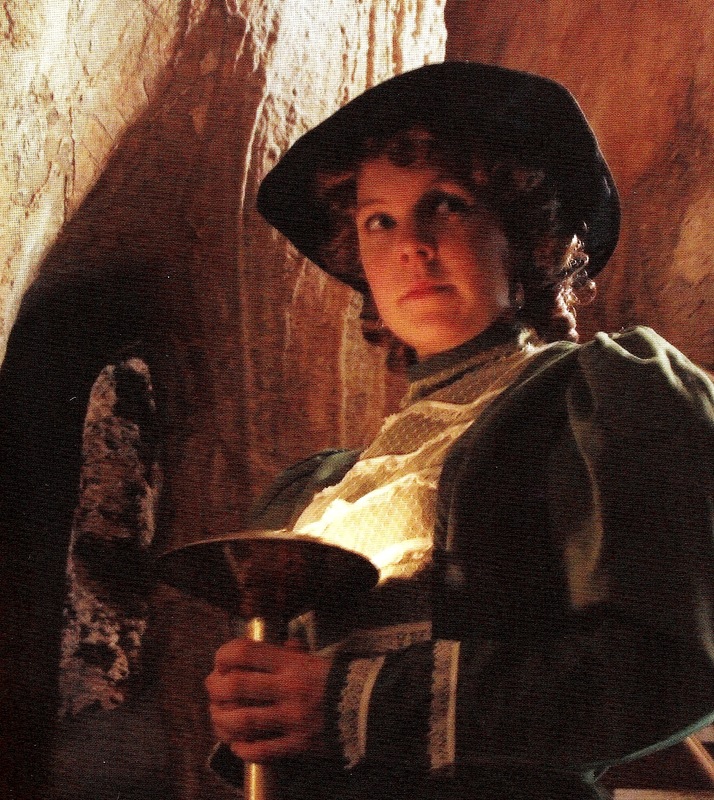 CAVE DISCOVERER Rebecca Lewis as Catherine ‘Katie’ Webb, the woman who discovered Jenolan’s Chifley Cave in the 1880s. “‘The Cave Girls’ is a name that was given to a group of women in an old photo and the name just kind of stuck!” Rebecca explains. “The thing that we all find interesting is that they are all wearing men’s clothing! We don’t know for certain who any of the women are, but we believe Katie and her sister Selena are amongst them. Comparison with later photographs suggests Katie and Selena (known as Nellie) are the central figures seated on rocks, with their mother (also Selena) standing at the left. Katie Webb’s father Edmund Webb accompanied his family to Jenolan on the day of Katie’s discovery – his name and those of Katie’s siblings Selena and Edmund Thomas Webb appeared on the plaque seen by Cook. Webb was a prominent Bathurst businessman and politician, whose empire included the supply of clothing, footwear and millinery to the Central West. The uniform clothing of the three women at the top of the ‘The Cave Girls’ image might indicate they were supplied by Webb specifically for the purposes of cave exploration. In her often humorous Letters from Samoa (1891-1895) Margaret Stevenson (mother of writer Robert Louis Stevenson) sheds light on how visiting female tourists were attired at Jenolan. Described as a “dedicated Wesleyan Methodist”, if Edmund Webb was anything like American Wesleyans, the rights of women would have been firmly entrenched in his family principles, enough for his daughter’s name to be forever linked with her discovery in the way Jane Falls’ may not have been. The plaque observed by Cook in the 1880s is long gone, but a signature which may be Katie’s remains by the steep entranceway to her bower, reading ‘C. J. Webb’. In what is now known as ‘Upper Katie’s Bower’, someone wrote ‘Katie’s Bower’ and the date matching the plaque. The original floor level below the writing was lowered in the 1920s to allow for a new exit from the cave. Allowing for this alteration, the writing would originally have been about the right height for a young woman to record her own name and the date of her discovery. Jenolan guides’ oral histories vary on the approach Katie took from Lucinda’s Cave into the bower which still bears her name, with two possible routes. One is the steep slope with a very deep chasm at the bottom (now followed by the stairs). The other is a hole below what is known as Lucinda’s Column, which requires a significant abseil. The two dates recorded allow for the possibility that Katie’s discovery over more than one day’s exploration, and that both passageways were attempted. And what did Katie do next? Another name on the original plaque was ‘E’ or Ernest Bowman, the man Katie married just over a year after her discovery of Katie’s Bower. The two lived their married life in the Central West, and as Catherine Bowman, Katie was awarded an MBE in 1924 for “her many years of devoted service to the community”. In 1925 she and her daughter were presented to King George V at Buckingham Palace. The next time a woman was credited with the discovery of a cave at Jenolan was almost 130 years after Katie. “Deborah Johnson, a member of the Sydney University Speleological Society, discovered a cave in Jenolan’s Southern Limestone in January 2009,” Rebecca explains. Within Jenolan’s Guides Office an honour board lists long serving guides back to Jeremiah Wilson. Both men and women are identified only by their first initial (the same as most signatures on cave walls), making it hard to identify the first female guides employed in the 1980s. 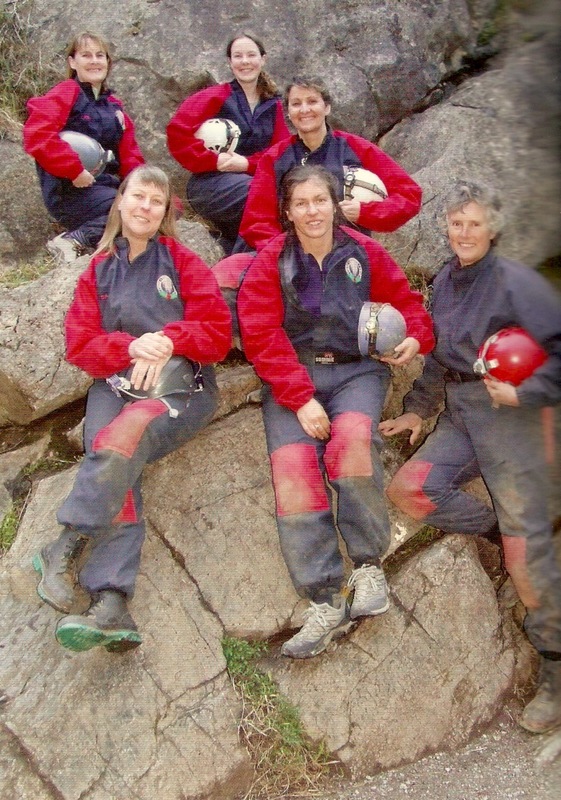 CAVE GUIDES Rebecca Lewis (top, middle) and a group of long-term female cave guides. “It wasn’t until 2005 that the number of female and male employees reached equilibrium, with female staff undertaking all the same regular duties as male staff,” recalls Domino Houlbrook-Cove, who started as a guide in 1989 and is now manager of corporate, functions and events. On occasion, visitors to Jenolan can still experience the courage of Katie Webb, played by Rebecca Lewis on a history tour. “It’s so much fun! I get a great response from people who even today are amazed at what Katie did, especially for her time,” Beck enthuses. “People love stepping back in time to do a tour with someone from that era. I find I get asked more questions about the women cavers when I’m dressed as Katie than what I do when I’m guiding normally”. “Jenolan has been a great place to work for a number of reasons. Mainly, though, it keeps you on your toes. It’s never like giving a speech where the words are there in front of you, you have to always be ready to answer any question that comes your way. It means you have to hold a huge store of information ranging from geology to history to everyday guiding and maintenance activities. You’re always learning and updating your information as a guide, not to mention ~the physical side of things. Thanks to Jenolan guides David Hay (cultural initiatives) and Keith Painter for historical information. Details about Catherine Bowman from ‘Written in Gold: The Story of Gulgong’ by Eileen Maxwell (1978). BEST FLIPPER FORWARD in the jobseeking game. A Writer’s encounter with unemployment, Part Two. FOUR months and 70 applications since my last job, I gave up applying for work using the internet and employment agencies, doubtful of the software used to scan applications for keywords. Instead, I turned to my local paper. There was no shortage of positions advertising a “no more commuting” lifestyle and I could have applied for any of them using pen and paper … but I’d have to think laterally about my skills. My interview drought broke. First time was a local antique shop seeking a part-time sales person. With experience in design and decorative arts, in addition to sales, I had skills to sell. The interview began as most do, but out of the blue I was asked for one word which described me positively and negatively. I panicked, blurting out “perfectionist”. That seemed to go down well. But the next day I got a message saying I’d come a “very close second”. It was during the Olympics, so I wondered if my bank would accept a silver medal for a mortgage repayment. INTERVIEW INSIGHTS try not to be as weird as they are! My second was for a part-time administration job with a local training company. I was interviewed by the vice-principal and the CEO, who was so enthusiastic about his company that I worried I might be asked to invest. It proved difficult to sell my training and admin skills against that energy, and as I left I was presented with a corporate-branded showbag full of company merchandising. Lovely. They’d get back to me in a few days. Over a week later I got a call saying they’d found someone excellent. The showbag went into the recycling bin. A group interview for a housekeeping job at an eco-lodge started late when two of us got lost in the bush on the way. The manager scanned our physical fitness for bunk-bed making abilities, and said there was no probation – you were either an expert bed maker or not. One applicant immediately excused herself, citing back problems, , and the manager all but gave the jobs to me and the other guy, saying he wanted to increase the male staff. Maybe I wasn’t man enough, since I got turned down. I saw the other guy at the supermarket later that week with his young family, beaming with new-found buying power, while I still had to budget. A fantastic job requiring every shred of my communication skills taunted me throughout this period. I spent a week preparing the application but heard nothing for two months, when a call came with an apology for the delay and an offer of an interview. To me, a “delay” is a train 20 minutes late, whereas a two-month silence could be concealing a shemozzle. Well after the appointed time I was left waiting, fending off annoyance by soaking in the wonderful natural surroundings of this cultural organisation. Finally I was in front of a panel and almost an hour of scenarios and questions. They took notes, asked me to extend on my resume and discuss my future plans and dreams working with them. By then I really wanted the job, based on the human contact alone. At last I was being genuinely scanned by other souls, not computers or employers who felt they were the only ones with needs. Two weeks later I got the offer. Relief flooded through my bones as I arranged my start date, which is not for another two weeks. 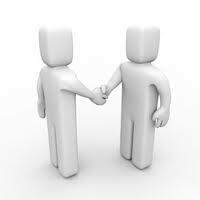 But I think this will be a long, mutually beneficial association worth a lot of patience. Since my job-seeking began the economic crisis has kicked in and I am no longer in the minority – I have crossed paths with many others desperate for interviews. Employers are advertising fewer jobs and asking staff to move sideways or take pay cuts. PANEL SHOW Sometimes they’re a relief. 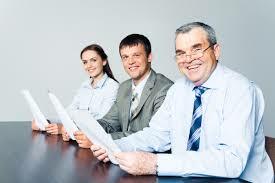 Employment agents are attaining minor celebrity status as they are asked how to secure a job in the current crisis. No wonder I had problems earlier on. But I have come to understand that people get jobs in many unconventional ways. My friend who first told me about the application scanning software recently had a great position created for her because her company “just liked her” at an interview, even though the advertised job went to someone else. Human contact, not human-computer contact, seems to be the real key – presenting yourself as you are, not allowing yourself to be filtered by technology. I was lucky that my search led me to a company which still expects its human resources staff to select candidates using gut feelings alone. I’ve been asked my advice about online job seeking, keywords and application scanning, but since none of these involves human contact I avoided them, and stopped applying for any job which did not provide access to a real person within the company. It’s been a challenge to swim against the tide. Published in the Weekend Australian 2008.